Disclosure: I received a store credit to help facilitate the review. All opinions stated are genuine and my own. What can you get for $50 from SwimOutlet.com? 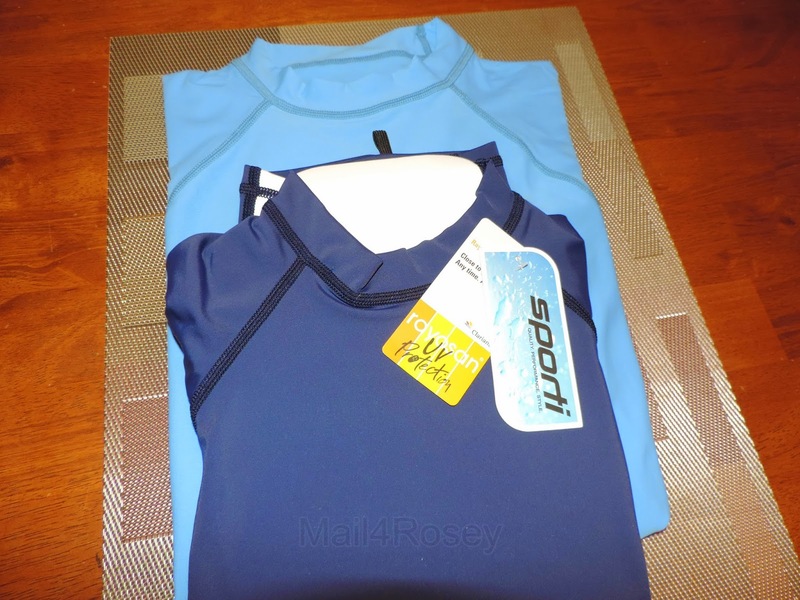 Most everyone knows that the rashguard shirts, or swim shirts as my kids call them, can cost a small fortune. So when we were cleaning up the closets (Spring Cleaning is in full swing over at my place! ), I was a bit miffed and dismayed to see new swim shirts were going to have to be on the shopping agenda this year. We realize the importance of protecting the kiddos' skin from harmful UV rays, and as such we are willing to pay the extra to do so, but I'm here to tell ya that with SwimOutlet.com, paying just got a whole lot easier! 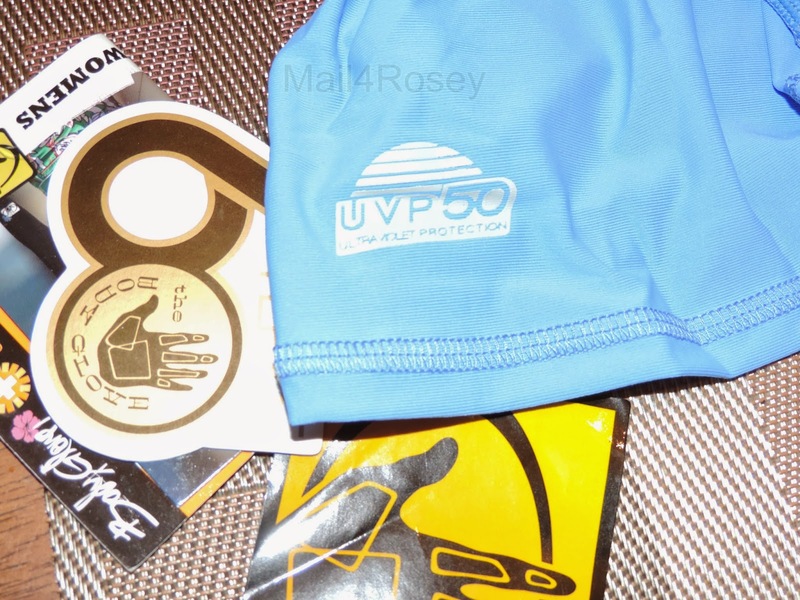 With my store credit of $50, I not only got a rashguard shirt for each of my children, but I also got two other items as well. Oh yeah, we are well on our way to bringing on some summer fun! Comes in many colors, we selected Blue. The first item selected was for my teen. She just turned 16 a couple of weeks ago and is very quickly outgrowing her young girl wardrobe. I gave her the first go at picking something out from the website that she would like. I thought the whole $50 would be gone, but the prices on the site are so good that there was money left over for her brother to have some items too. 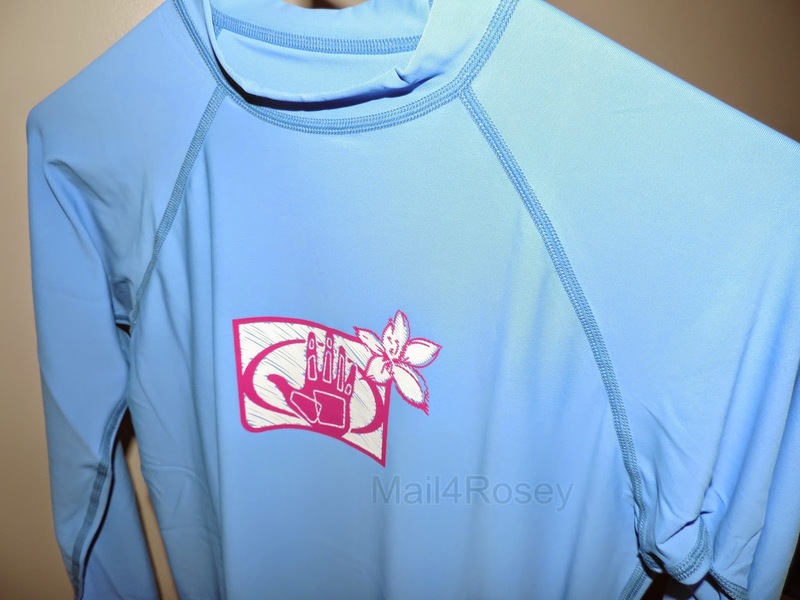 The shirt she selected was a Body Glove Long Sleeve Basic Fitted Rashguard. She has fair skin like I do, so the long sleeves will be great for keeping her protected this summer. At the moment, we are planning a beach vacation for the summer, and this will be the perfect accompaniment to bring along. My son also outgrew his rashguard shirt from last year (no surprise, he's quickly outgrowing every single thing he owns, lol). He's not a fan of long sleeves for swimming though, so we went with the short-sleeved Sporti Youth Unisex Sport Fit Rashguard. I ordered the size he now wears, and I don't know if it's the 'sport fit' or what, but it is a little snug for him too. We LOVE the shirt, but one glass of milk and he's going to outgrow it. ;) I'll be offering this shirt to his cousin who is a year younger... and ordering a new one for my son, the next size up. Probably good sizing information for you to consider if you're going to get one of these too. At just $12.99 for this high quality make of a shirt, the price absolutely cannot be beat. It comes in various colors and has a body slimming or sporty looking white stripe along each side. I might get a pair for everyone in the family! 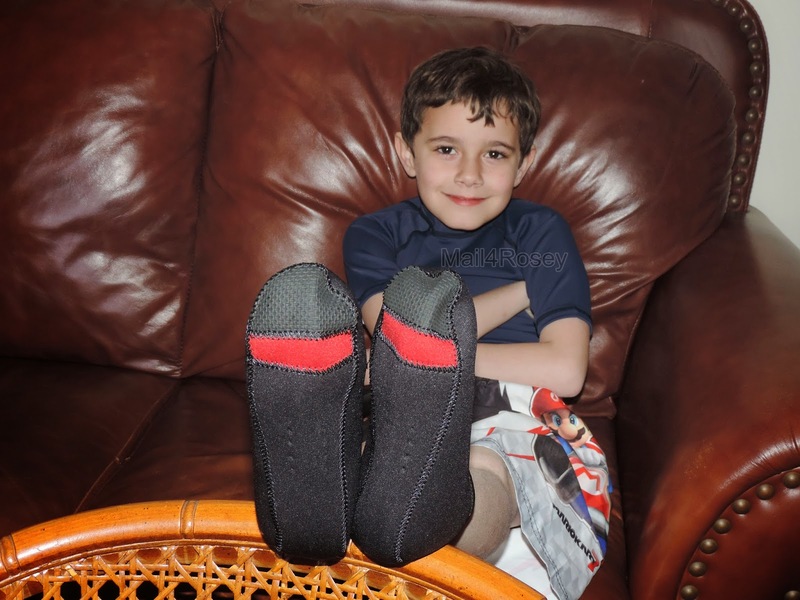 The next item we purchased was a pair of Neoprene Swim Socks for my son. I don't know about you, but wearing flip-flops to walk across the hot sand is always a bust. The sand gets inside of the shoes and burns your feet anyway. And the hard bottom, soft top swim shoes have elastic around the ankle that bothers my son...so those are out. Until I visited SwimOutlet.com I had never heard of these swim socks, but now that we have them, I am in love! through the summer and beyond. The reinforced stitching on the toes helps add to the durability, and I highly suspect these are going to last throughout the summer and beyond. They slip on and off easily, but aren't loose enough to fall off. I love how easy they are to slip on and then if you want, deliberately to slip back off. They do not have snug elastic around the top, but they are still going to stay on until you want to take them off. My son ran, jumped (and tried to slide across the living room floor ;) ) in these, just to test them out. from the hot sand. And he can swim in them too! The Neoprene Swim Socks are by far the most exciting purchase we've made of the year, and I can't wait to officially test them out. At just $8.99 a pair, I might end up getting everyone in the house a pair! They come in black as shown, or in blue. 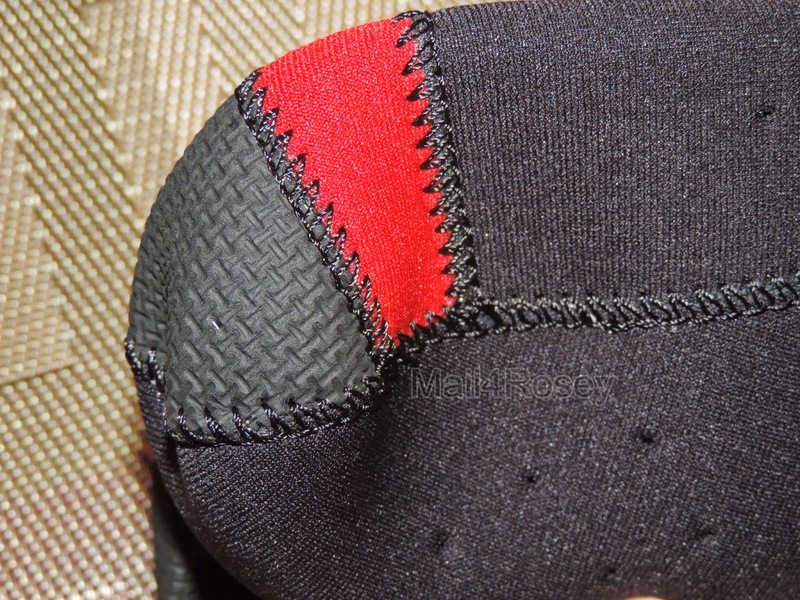 The socks come with built-in ventilation holes for drainage and breathability. When the order was all tallied up, I still had $3.00 left to spend. A Picky Bar went right into my virtual cart. I have been wanting to try these anyway, and the All-In Almond flavor was an easy sell. This agave-sweetened energy bar is gluten-free, soy-free and it's jam-packed with almonds, cranberries and chocolate chips too. And that was the end of my shopping escapade. Not a bad way to get an early jump on summer, if I do say so myself. This was my first experience with SwimOutlet.com, and I couldn't have been happier with the results. You can learn more about SwimOutlet.com by visiting their website. You can also follow them on Twitter and/or Facebook. I just took my Grandkids shopping. I did get the youngest girl a swimsuit that she loves. I am taking all my family to the beach for a week. I wanted to get all of the kids swim/sand socks. I also want a pair for myself. I have such sissy feet. We used to buy from them all the time while our girls were on the swimming team. They have the best prices on swim caps! It is beach weather here in Florida. I need to go online and do some shopping. The swim socks would be great for the water parks too. I am so jealous. We had snow late last night. Didn't stick ... but still snow. Same here, we got a nice warm week that melted the snow, but this week has been a relapse. Still, we are miles ahead of where we were last year when we still had a foot of snow on the ground. We drove down the Pacific Coast Hwy yesterday, couldn't find a parking space. Loads of surfers--it was delightful. My two need new beach shoes this year. Both of their feet grew and they need new ones. Looks like the perfect place to shop with summer coming up. We need out beach gear and this place has it! I know I'm going to be checking them out for swimsuits. I agree, I need to get new beach gear too. It is time to do some shopping. I have never seen water shoes like these before. I need to get these for my kids for the beach. I love these, we have a pool and I love buying swim gear and clothes. These look great, will have to check out the site! I need to buy a new swimsuit. I think mine is 14 years old. I will have to go check this out! I love saving money any chance I can get! My best friend has 2 kids that are swimmers. I bet she'd like to know about this site so she can get some bargains on all the swimwear her girls go through! I like the swimsock idea. Love the look of them. I love those swimming socks! He looks great! I've never heard of the swim socks! So amazing! 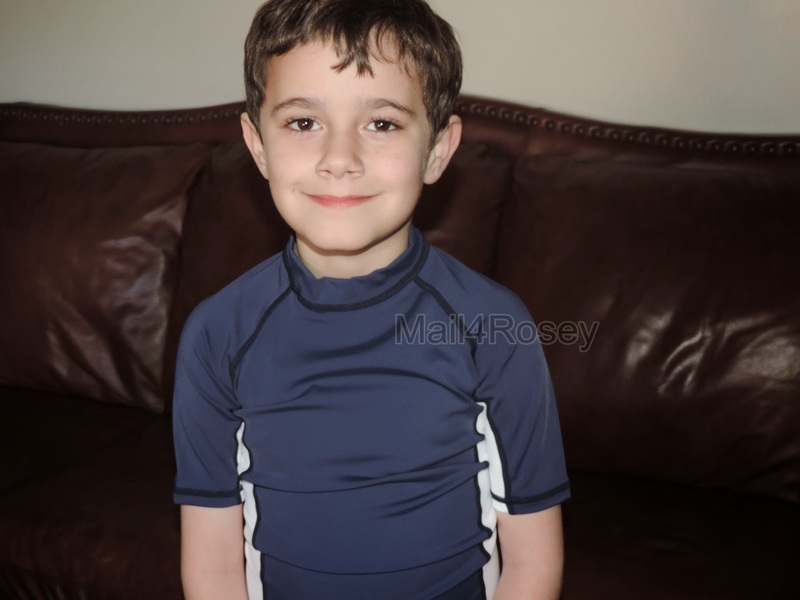 We always buy the rash guard swim shirts for my 4 grandsons. I'll have to tell my daughter about the swim socks. So neat! What cute stuff and I really love the swimming socks. I'd love to get the kids some before they go to summer camp (and myself). I don't let them shower without something on their feet and I think these would be just perfect. This is great! I shop at outlet stores for everything whenever possible. You can save a ton of money. Those swimming socks are really great. I never go to the beach without a pair. Those swim socks looks awesome, so much better than the shoes that are constantly getting smelly/stained, etc. I didn't even know such a product existed! I'll definitely be checking these out for our water park outings this summer, thank you! You got a lot for your money! Love how his shirt looks! Now if only the weather would cooperate and let us go swim! Those swim socks are really cool. I have seen the swim shoes, but never the socks. I love Body Glove gear. Their products are so durable! Those tops are really great for protecting kids from the sun. I love the sound of the swim socks too. Oh how awesome! My kids need new everything for this summer so I will have to check it out! Good to know! We love going to the River in the summer and we are always looking for great quality swim items. Everything looks so good and I'm glad you were able to find the gear for a good price. These things can get really expensive especially with the kids constantly growing out of them. How cute. I love the idea of swim socks. They look like a great way to protect the kids feet especially at a water park. This is a great place to learn about as these normally are expensive and it is nice to hear about a place that sells quality and affordable prices. Living in Florida these are a must. Swim socks? How cool! I definitely want to get some of those for my kiddos for this Summer. Thanks for sharing this awesome place. That hot sand is the worst. Those are great since they're still super flexible for walking, but protective! Wow I haven't heard of some of these products, thanks for sharing. Very important to protect your feet. I haven;t seen those swimming socks before. Seems like a better option than the shoes. Seems like you got a lot of stuff for $50, thats great. I will have to check this out. Looks like they have some innovative products. I literally thought I had burns last week the sand was so hot! I wonder how it would feel to run in? Thanks for the info! I would have loved to have those swim socks for the kids when they were little. Passing this on to my parent friends! I am definitely checking this out. I live in Arizona and its swim season now! Swim socks sound like a must have! Pools and the ocean can be so unsanitary! Those footies look perfect for our beach toes. Thank you for the share. Both of my older boys grew out of their rash guards, so I'm definitely going to be checking out this site! Love the swim socks too- I've never seen those before! This post reminds me that swim season is right around the corner! And I can't wait to get back in the pool! we all need new swimsuits. Will have to check them out! My son and daughter are needing new swimwear sometime soon. I'll definitely be checking out this site! Have to be ready for summer soon! Definitely checking this site out for good stuff! I haven't heard of them before now but will check them out. With summer quickly approaching, I want to be ready to hit the pool! Oh wow, it's that time of the year again eh? We're still in the cold side but we will get there. I like these swimming gears, they look like made from high quality materials. I wouldn't want to shell out so much for swimming stuff especially coz they're seasonal. I'm glad there's swimoutlet.com for those good swim stuff finds. PS. I'm totally digging those neoprene socks. That looks like great stuff! I've never even heard of this place! My son is staring seimming lessons in two weeks and I can't even find him a simple, well-fit bathing suit!!! Ugh! Those swim socks look a lot more comfortable than water shoes! What a great idea. All the swim gear can get expensive when you add it up, thanks for sharing! Swim socks, how cool. I have never heard of them but I imagine they would be 10x better than the swim shoes I force my kids to wear in the river, and lake. You got a good model there, looks like he was having a blast! I have used swim outlet before its amazing. And I love swim socks. I have major germ issues so whenever I use a public pool or go to waterslide park I wear them. Also use them in hotel bathrooms because of my germ issues they are great. This is awesome! I have to buy new swim gear for 2 growing kids, so this came at just the right time! I will definitely try looking at swimoutlet.com. Those swim socks are so cool! This is the time for the swimming! I"ll have to check out their links. This sounds like a great deal! We need some new swimsuits in our household so I'll give this a look. First time hearing of swim outlet & I have to admit it sounds great!! Love a great deal! I have a toddler that needs all new swim gear once this snow goes away! I will definitely have to look into this when I start shopping for summer clothes for my girls. That sounds like a great place to start. I so need those swim socks. We go to the beach quite often here in Florida and those would come in handy to have with the kids. I need to check out their selection! I would love to see those water shoes on my son! I am so excited- I just got a running skirt I am so in love with from Swimoutlet.com! Yay for awesome products! We love shopping with swimoutlet.com. They have a huge selection and the prices are perfect for my budget. I need to get our kids some new swim shirts. I'll need to check out swimoutlet.com. Thanks for sharing. My kids are in need of new swimwear so i'll definitely be checking them out! I am going to have to check this place out. Kiddo needs swimwear and accessories, Looks like a good place to shop. Seems like this is a must to check out - its good to know we can buy swimwear within convenience. I really love this. This swimsuit perfectly suits to your son. And I love the stitches on the socks. Will have to check this out for my kids. Thanks for sharing. I never knew about these shirts before so I will have to check them out indeed. I love the swim socks and may have to invest in a couple of pairs. The bars would be something my son would totally go for because he went gluten first this year. Thanks so much for sharing. Oh cool! 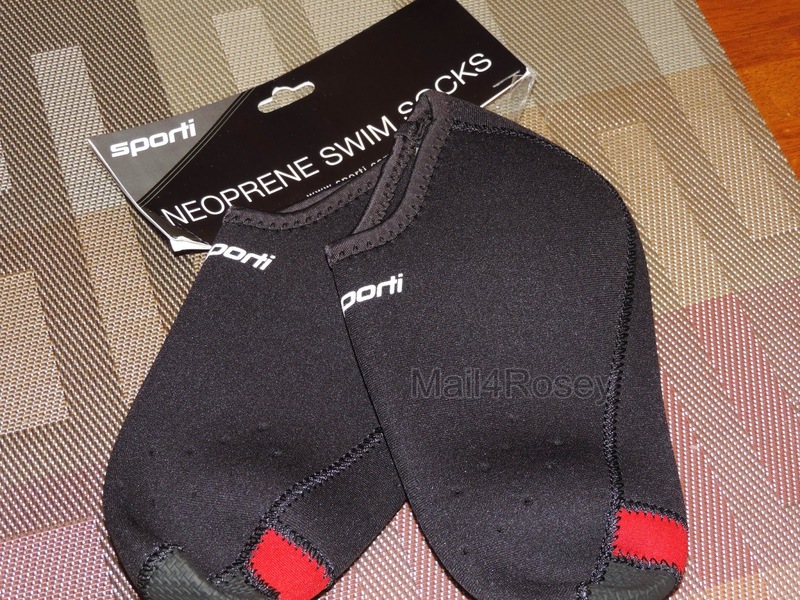 I have heard of swim shoes before, but not swim socks – those sound like they fit more comfortably. 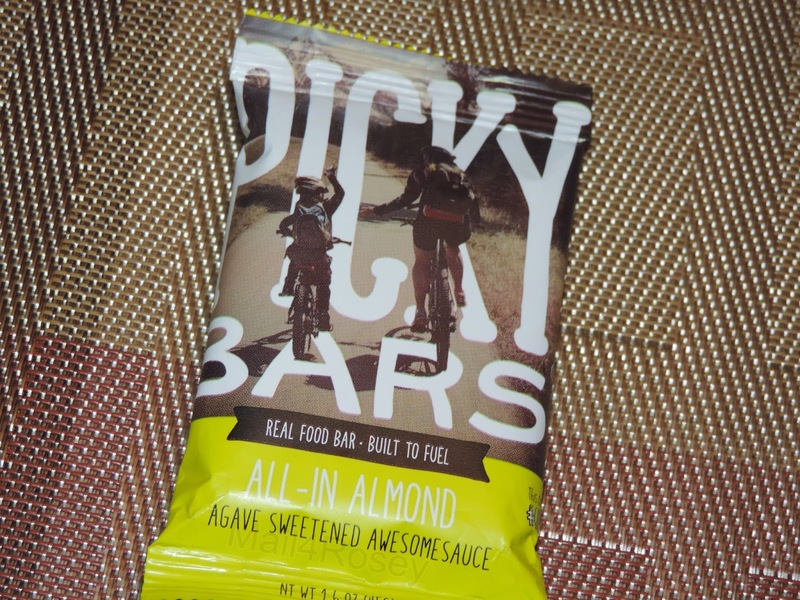 Haven't heard of Picky Bars before, but sounds like something I would eat to refuel. How adorable is that model?! :) I haven't heard of this brand before but I will check it out. My son does need a new set of swimwear. I am always on the lookout for places that I can buy quality swimwear, Now I can add this to the list. Thanks for the great review. I've never heard of the Swim Outlet before but I will have to check them out. Summer is coming up and so need new swim gear. Is this a generational thing that I have never heard of swim shirts or socks? For myself I could not swim with a shirt on over my bathing suit--those socks would help the poor burning soles of my feet--wonder if they are good near a pool. That's some awesome gear! I've never been to this site before. I'll have to check it out so we can get stocked up for the season. Perfect timing. It's time to update my kids swim clothes for summer. I have a feeling we'll be spending a lot of time in the water. I've never heard of this place, but it sounds like they have everything my family would need for a day at the beach. Except the beach, LOL. I've never heard of this, but I'm sure going to be using them for our upcoming trip to the beach. Very cool stuff! I need a couple of those swim shirts for my boys. I always worry about them getting burnt and this is an excellent solution. Let me tell you, I am glad to know of these swim socks.. talk about new to me!! !